original but in no way tames its performance. 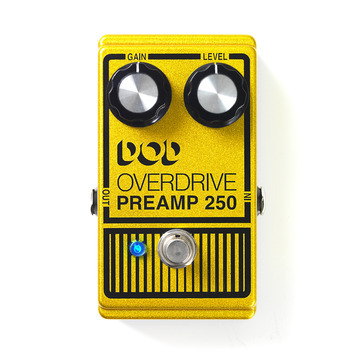 The legendary analog DOD Overdrive Preamp 250 is back, with over 40 years of history and experience behind it. The new 2013 version of the legendary DOD 250 captures all of the classic tone and wild heart of the original but in no way tames its performance. The 250 is better than ever before with true bypass, a crisp blue LED indicator, gobs of output, and modern 9V DC power supply input. Redesigned with a lighter aluminum chassis, sleek yellow (gold?) 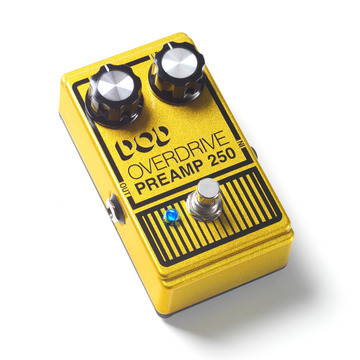 metallic flake and flat black matte bottom paint job, the 2013 DOD Overdrive Preamp 250 pedal is the perfect sonic foundation to carry on the legacy of DOD. This pedal is similar to our Analog Man modified previous version DOD 250 and 308 but it is not a hand-wired pedal, more a factory made pedal so if it breaks it won't be as easy to fix as the previous version. I've had a few DOD OD-250s over the years. I always loved the tone, but hated how I had to power them and how noisy they are. Well, those days are over. I sent a standard, yellow reissue to Mike and had him put the 741 chip in it, turn it into true-bypass, Boss-style power connection and an LED to boot. This is now, by far, my favorite drive pedal. It's such a thing of beauty. Warm, rich tone. I've had friends comment on how this thing sounds...wondering what in the hell sounds so good on that little pedal board of mine. Thanks again Mike! You're an asset to the music community for sure.